The Japanese culture is rife with musical influences. Indeed, one of the richest aspects of their culture is their music. Though not everyone may be familiar with the terms and technical aspects of Japanese music, I am sure that many are at least familiar with the looks and sounds of their instruments. One of the most important of the Japanese traditional musical instruments is the koto. The koto is a traditional string instrument which actually has its roots in the Chinese zither. In fact, the koto is considered to be the national instrument of Japan. What are the origins of the koto? According to one legend, this instrument was formed in the shape of a dragon, which we know is a mythical creature held in reverence in the east. On the more practical side, though, the koto was introduced to Japan by traveling Chinese and Korean musicians in the 7th century. In the beginning, the koto was only used for royal audiences but by the 15th century, it was widely used to entertain the common people as well. 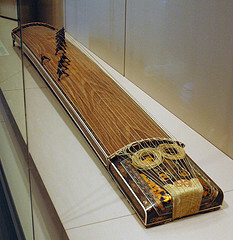 The koto has 13 strings, all of which are stretched along the length of the soundboard, which is about 2 meters long. The soundboard is made of wood while the strings are made of synthetic material (these days, at least). In the old days, the strings were made of silk. The strings are tuned by bridges which can be moved, made of ivory or plastic. Today, the koto is still used to play music and many music schools in fact offer classes on how to play the koto.